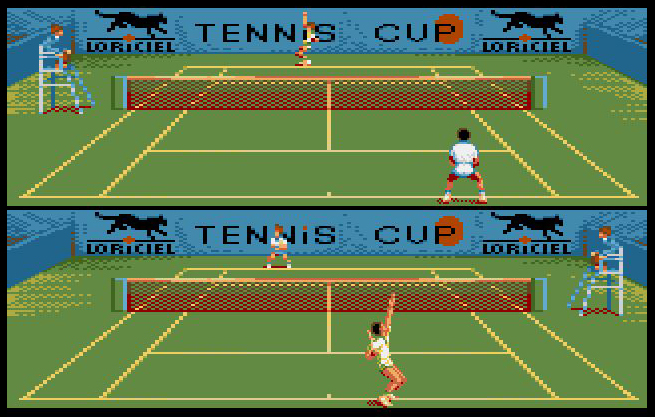 During the tragically short life of the GX4000, the system was graced with two half decent tennis simulations, one of which was the only 8-bit version exclusive for the platform. 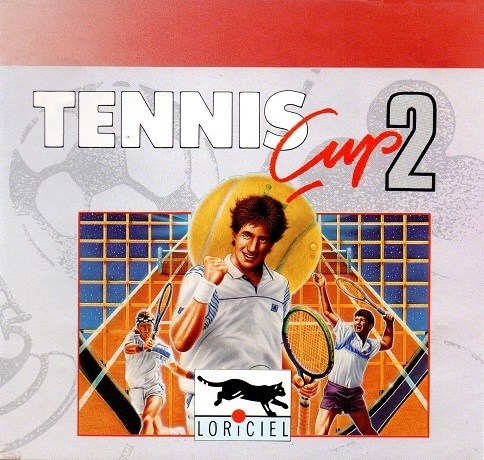 Loriciel’s Davis Cup Tennis had been given the treatment on the TurboGrafx-16 to average acclaim, overshadowed by Final Match Tennis, and its CPC tri-colour counterpart Tennis Cup received a similarly lukewarm reception. Re-vamping the visuals to full colour and stretching the options out, Tennis Cup 2 for Amstrad’s console bore all the quality traits of its 16-bit counterparts, the French developer keen to utilise the improved hardware (one of the only software houses to do so). To the casual 8-bit gamer, it really impresses on the eye for sure, and boasts smooth split screen 2-player action to boot, but did it give an all-star strawberries ‘n’ cream performance worthy of winning Wimbledon? The title screen hints instantly of the effort Loriciel have gone to, testing the graphical waters of the GX impressively and topped off with a neatly animated logo just for good measure. 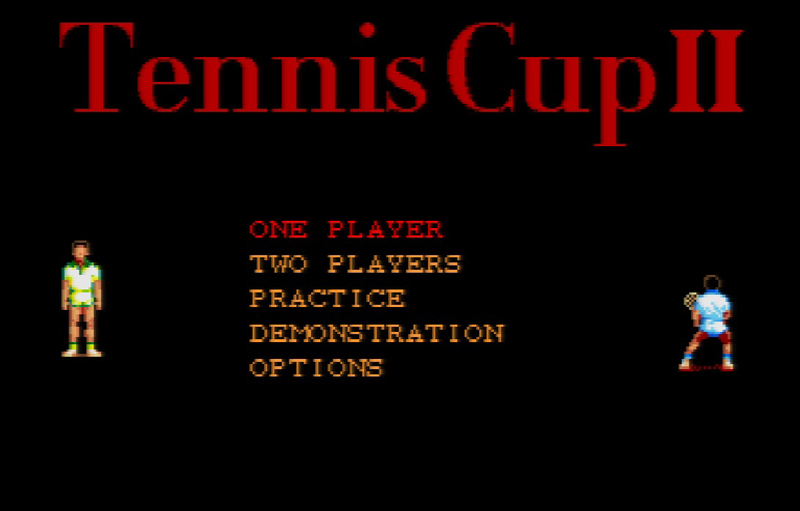 The improvements throughout the game make it far superior from the CPC’s Tennis Cup, with full colour, hardwired sprites, smooth lines and slick menu’s. The in-game screens are a gem to behold; the split-screen is glitch free and stable, the colours are vivid and defined, and the sprites are suburb. Well, one is. The player at the far end is a tad imprecise and blocky, miles away from the high quality of the foreground player, but still mirrors the actions accurately. The ball movement is also good enough, the depth perspective reasonable but not perfect with the odd dodgy bounce here and there and some unfortunate speed inconsistencies. Judging the ball in flight requires quite a bit of practice, it’s certainly not the kind of tennis game to pick up and play with ease. It would fair to say the graphics are impressive by 8-bit standards, a glimpse of the GX’s true power, but let down by decidedly jerky animation, a lack of small details (like line judges) and a nominal range of positions that can be held on court, the latter becoming a cumbersome grade-defining bane. However, I resist the easy temptation to lay the blame on the visuals for the somewhat problematic gameplay; it’s a very, very good looking Sphairistike title. Another match point goes to the audio too. The sound within the centre court is very well done, good sporting acoustics if you will. This includes fuzzy crowd noises, a selection of bobs and thwacks as the ball hits racket, and even a cheeky ‘Cyclops’ reminiscent bleep when the ball is called out. The assisting music is all good too, a nice genteel title theme and the introductory bars of several national anthems before play starts. Nice. The syncing is pretty good too, with a few lose strings now and then, mostly when a game/set ends, but overall very little to complain about surprisingly. With a little cleaning up in places and maybe a touch more variety, much like the graphics, the sound qualities are almost faultless. So it looks the business, sounds the part but does it play the advantage point? With a sports simulation like tennis, fluidity is a highly important part of the programming to get right and regrettably Tennis Cup 2 merely only gets to a losing tie-break. This is exponentially frustrating because it comes so close to living up to the cover blurb; claiming of ‘superb realism’, but it just feels like its half way there. For all the great points it has, they are undone by some irksome gameplay. For instance, the range of shots at your disposal is excellent; with forehands, backhands, volley’s and smashes etc. All can be directionally controlled in both axis and the assisting shot animation is top drawer. But, with the limited movements of the player, coupled with the suspect and sometimes inconsistent ball speed makes it near impossible to use them effectively in combinations, so lot of the time you end up just whacking the ball back randomly whilst keeping a fixated stare on the yellow orb. Even then it will occasionally fly off court when you have performed a perfectly reasonable shot. It seems that too much has been attempted to push into this, unlike its GX doubles partner Pro Tennis Tour which keeps the action more straightforward. Whilst this strains to extend a nod to the real game in terms of realism, it all becomes a bit too much to cope with on-screen. Split-screen, cause it's no fun playing from the back! The final small grumble I have is with the control system; again exhibiting promise but hindered by needless and avoidable problems. Responses are good and well honed, but why on earth are the control ports reversed I don’t know. This just makes things confusing but more annoyingly you cannot exit a match without tapping the console mounted pause button repeatedly. Silly. 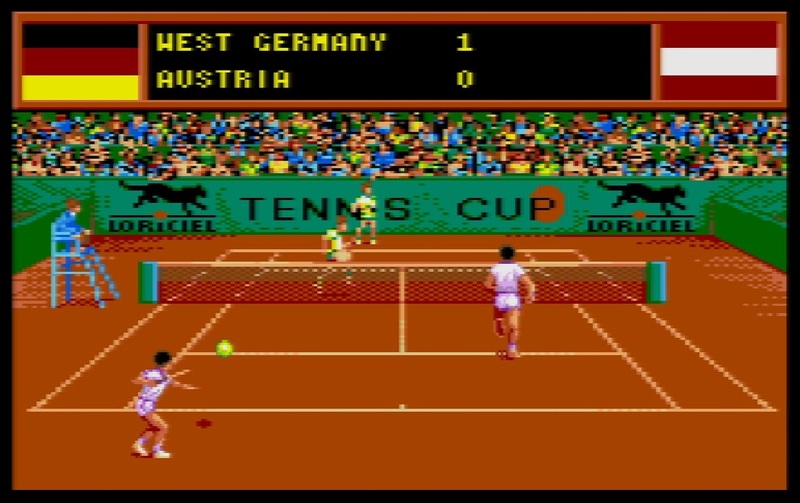 That said, I cannot not ignore the fact that it is quite exigent at times, with a wide assortment of options and game modes to be getting on with, a good selection of customisable settings for player attributes, nice two-player action and all four grand slams included, even depicted by their real-life names (even Super Tennis doesn’t do that!). 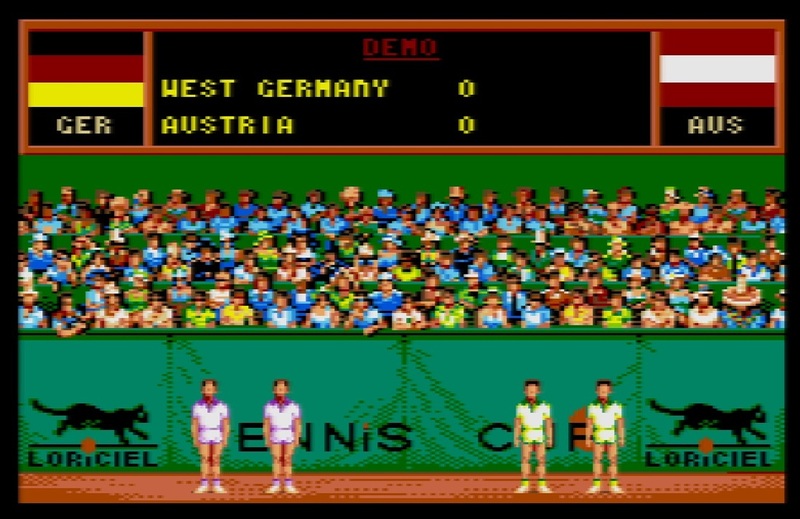 The choices of nationalities are very apt too; if you didn’t know beforehand, you can tell this game is A: French B: Tennis. Why? Because Britain isn’t represented! Oh how I chuckled. Whist this has the edge over Pro Tennis Tour in the presentation stakes and certainly in the technical playing options, it lacks the all out smooth and slick reliable fun of other tennis titles. It’s down to a matter of choice really if you want to play ye olde sticky on the GX4000. This does provide some lovely 8-bit eye-candy and a few thrills, but at the same time annoyingly skewed in playability. To its detriment, this becomes too bothersome and so its lifespan is cut short. One of the just-above-average tennis titles of the era for me, like getting knocked out in the quarter finals. Match!